Making it easier to fly to various points across the country, Flybe is to launch a new hop-on or hop-off service between Aberdeen and Jersey in October. Designed to be used as a ‘shuttle bus service in the sky’, Flyshuttle, will fly between Aberdeen and Jersey, stopping off en route in Leeds and Southampton to pick up or drop off passengers. For those that stop on, the total journey time will be just over four hours. A spokesperson for the airline said the new service would make the route more viable, and will be reinstating Flybe’s links between Leeds and Southampton. It is also creating a new link between Aberdeen and the cruise port, opening up the cruise market to more customers. “Rather than offering lots of different routes with low load factors, we are offering one hop-on, hop-off service, similar to the way domestic airlines operate in the US,” said the spokesman. Paul Simmons, Flybe’s chief commercial officer said: “FlyShuttle is a convenient and affordable concept for the regional marketplace that gives customers extra choice and additional connectivity for everyday air travel. “Today’s announcement is another significant landmark in the re-birth of Flybe. Designed to be used as a ‘shuttle bus service in the sky’ all the way between Jersey in the south and Aberdeen in the north, we are again showing that we are ‘the fastest way from A to Flybe’, faster than road or rail – and certainly more affordable. The service could also mean it will be possible to go for a holiday cottage break in Yorkshire, Scotland, the South coast of England and across to Jersey in much quicker and more convenient time than other forms of transport. This weekend (15th-17th November) is the annual Teignmouth Jazz and Blues Festival! Managed by the newly elected Jazzteam, there are many gigs and events to get you in the mood for a groove. For example, Jim Mullen will be playing with the Zoe Francis Trio already featuring the great Dave Newton on piano! With four main venues plus many more fringe events alongside, there are a variety of tickets to cover your needs, be it for the full weekend experience, or selected days. If only one of the gigs catches your eye, then each event is £10, unless you’re a student, in which case you can get a bargain at £5 per gig. Still with availability is this ancient Grade II listed cob and thatch semi-detached farmhouse (sleeps 6). Set in the pretty village of Shaldon at the mouth of the river Teign estuary you’ll be well placed for the festival. You’ll also be near a lovely sandy beach, boats for hire, birdwatching, windsurfing and some great pubs. The property has a depth-of-house living/dining room with beam and inglenook (‘living flame’ gas fire), TV/DVD, DVDs and variety of artefacts/furniture from the owners’ travels. A smart kitchen/dining room with polished granite worktops, butler sink and Chinese slate floor. Utility area with Belfast sink, washing machine; door to back garden. Downstairs loo. Upstairs, there are three bedrooms – a double (6’ bed), a twin, and a room with two sets of bunks; bathroom (suite) and shower-room (suite). At the front of the property is a fairly large, enclosed walled garden with a partially hidden den and patio with table/chairs; at the back, an enclosed garden with large patio (table/chairs), steps down to a lawn. The August bank holiday is nearly upon us, and if you are visiting the South West for a holiday then here is a selection of just some of the fun things happening this weekend and beyond. The Watchet Festival (23rd-25th August) is a family friendly music festival with amazing views of the stunning West Somerset coastline and beyond. If you’re looking for a last minute break for the family, then day tickets are available at the festival and this stunning newly converted barn (sleeps 8) is a short drive away in the village of Winsford. 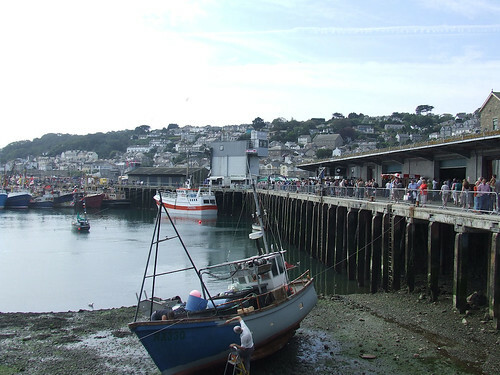 The Newlyn Fish Festival (26th August) is held at one of Cornwall’s most distinctive fishing ports. What better place to see live cooking demonstrations and a seafood auction than at the place the fish was caught! The festival hosts a variety of entertainment and fun for all the family. A little after the bank holiday from the 27th-30th August is the Bude Jazz Festival. A mix of free parade sessions across the pretty little town and ticketed events available to purchase on the day at various venues, it’s a good chance to get your jazz stomp on! Search for holiday cottages in Bude. The Great Dorset Steam Fair (28th August – 1st September) boasts over 200,000 visitors to this extravaganza of an event, dubbed “THE” National Heritage Show of the year. Entertainment is spread across 600 acres of the enormous show ground at Tarrant Hinton, near Blandford Forum. Many interests are catered for, from steam engines to heavy horses, ancient farm crafts to stunt displays, the list goes on! Stay at this beautiful Helpful Holidays semi-detached Grade II listed cottage in Okeford Fitzpane (sleeps 4) or search for more Dorset cottages on our main site. If you can’t make it to the Newlyn Fish Festival, or if you had a taste and want more, then on 1st September travel to Clovelly, North Devon, for the Lobster and Crab Feast in the iconic harbour. Not only that, but you can enjoy folk music, arts and crafts and some street theatre to keep you entertained. Still with availability is this single-storey house (sleeps 7) with views of the sea to Welcombe Mouth. Many congratulations to our friends at Helpful Holidays for sweeping the board at this year’s Which? Travel magazine member survey! For the second year running, Helpful Holidays came out on top of the survey rating holiday cottage and villa booking companies. They achieved and overall score of 91% and awarded 5 stars in every category, bar one. Which? is recognised for its unbiased and trustworthy endorsements, so to rate so highly by its members is a wonderful achievement. It also follows on from the recent Silver Award for Best UK Cottage/Self Catering Booking Company (UK Properties) at the British Travel Awards. Why not try this pretty, detached 19th cent. stone cottage in Beaminster, Dorset. With lovely wooded valley walks to neighbouring Netherbury, where the original ‘River Cottage’ from the TV series is located. Sleeps 4 and has availability in May. Also available in May is this neat, modern mid-terrace cottage, one of nine in a stylish, small development in Little Petherick. At the back, an enclosed, waterside, decked terrace (lockable gate with ladder to creek) and first-floor balcony are ideal for enjoying the lovely creek views and great for wildlife-watching: swans, egrets, herons and kingfishers frequently seen. Sleeps 4. With a 25% discount offer in May, you can’t go wrong with one of these granite built lodges (sleeps 6) overlooking Edwardian gardens, lake and tennis courts in the grounds of Bovey Castle, Dartmoor. All the hotel facilities are yours to enjoy, including indoor heated swimming pool, gym, steam room, sauna, spa (beauty treatments) and restaurant. Outside are hard and grass tennis courts (lessons available), croquet lawn (seasonal), cricket nets (late May to mid-September) and trampoline. For all of these Helpful Holidays properties and more, be sure to visit our main site to find your perfect holiday let. From the 19th – 21st May is the Devon County Show in Exeter. Enjoy three full days of West Country food and drink, the very best horses, goats, sheep, bunnies and cows, including the famous Devon cattle known as Red Rubies. Kids can plant seeds, bake bread, milk Daisy the model cow, weave willow wands, see chicks hatch and pet gentle farm animals. For those of you interested in craft there are lace-makers, quilters, weavers, spinners and dyers. Look out for demonstrations and take the chance to talk to these skilled crafts’ people to get practical advice on anything you may be working on at home. For a nibble, check out the BIG Devon cream tea marquee, with scones made by Richard Hunt, Executive Chef of the Grand Hotel, thick clotted cream and lashings of jam. There is such a huge list of things to do, it’s probably best to go to the website for full details. If that’s not tempting enough, then kids go free on Saturday! After all this excitement, why not go back to nearby Ottery St Mary (of flaming barrel running fame) to this gorgeous little cottage from Helpful Holidays that sleeps 4. A long, elegant hall leads to L-shaped living/dining/kitchen with TV/DVD and beautifully fitted kitchen area (dishwasher, washer-drier, microwave, fridge-freezer, gas hob) with small breakfast table (larger table/chairs kept folded in hall for more formal dining). French windows open to small patio area (table/chairs) immediately to the front of the house.. Oak stairs to first floor and two bedrooms – a double, and a single; very luxurious bathroom. On the second floor, a double bedroom under the eaves with smart en suite shower-room (suite) and 2 steps up to French windows to a small and very private roof terrace (table/chairs) with fine views over the town.